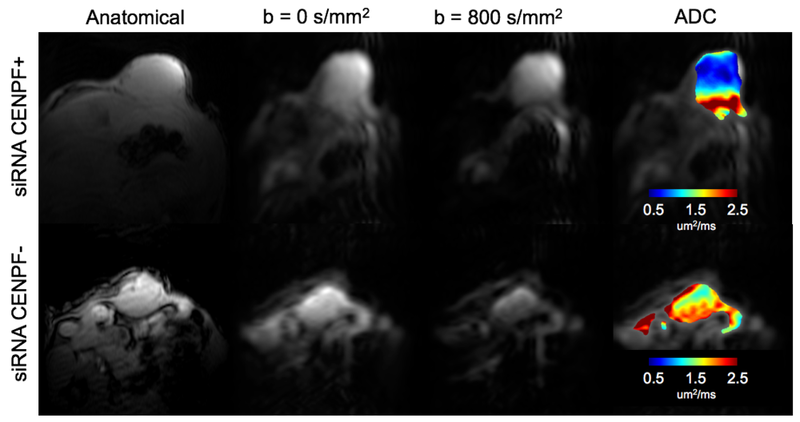 Using second order motion compensated (M2) encoding, we are to perform robust in vivo DT-CMR allowing for tractography. Collaborator Dr. Eduardo Marban developed exosomes derived from cardiosphere derived cells showing decrease in LGE scar. We have further demonstrated that the reduction in LGE scar also led to realignment of the helical myocardial fibers. Working with collaborators Dr. Sangeun Lee and Dr. Hyuk-jae Chang from Yonsei University, we have validated DT-CMR with 3D histology using a clearing tissue preparation CLARITY and light-sheet optical imaging. Collaborators Dr. Yibin Xie and Dr. Debiao Li demonstrated unique contrast to coronary atherosclerosis plaques. In collaboration with Dr. Yibin Xie and Dr. Debiao Li, we demonstrated DW-MRI can detect LRNC without the use of traditional Gd contrast. With collaborator Dr. Ping Li and Dr. Hyung Kim, we demonstrated that suppression of CENPF decreases the visibility of prostate tumors by modulating DW-MRI signal.